November 13 is the 317th day of the year(318th in leap years) in the Gregorian calendar. 48 days remain until the end of the year. 1841 – James Braid first sees a demonstration of animal magnetism, which leads to his study of the subject he eventually calls hypnotism . The St. Brice's Day massacre was the killing of Danes in the Kingdom of England on 13 November 1002, ordered by King Æthelred the Unready. Year 354 (CCCLIV) was a common year starting on Saturday of the Julian calendar. At the time, it was known as the Year of the Consulship of Constantius and Constantius. The denomination 354 for this year has been used since the early medieval period, when the Anno Domini calendar era became the prevalent method in Europe for naming years. Saint Augustine of Hippo was a Roman African, early Christian theologian and philosopher from Numidia whose writings influenced the development of Western Christianity and Western philosophy. He was the bishop of Hippo Regius in north Africa and is viewed as one of the most important Church Fathers in Western Christianity for his writings in the Patristic Period. Among his most important works are The City of God, De doctrina Christiana and Confessions. 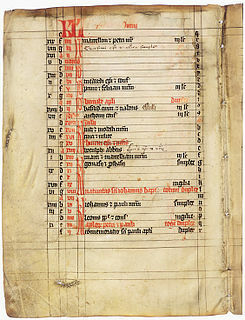 Year 867 (DCCCLXVII) was a common year starting on Wednesday of the Julian calendar. 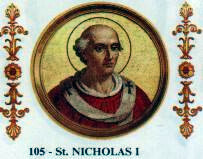 Pope Nicholas I, also called Saint Nicholas the Great, was Pope from 24 April 858 to his death in 867. He is remembered as a consolidator of papal authority and power, exerting decisive influence upon the historical development of the papacy and its position among the Christian nations of Western Europe. Nicholas I asserted that the pope should have suzerain authority over all Christians, even royalty, in matters of faith and morals. PalligTokesen was a Danish chieftain. He was recruited to help Ethelred II, and was made Jarl or Ealdorman of Devonshire. He is said to have been killed in the St. Brice's Day massacre, along with his wife Gunhilde, daughter of Harald Bluetooth of Denmark and sister of Sweyn Forkbeard. Sweyn's invasions from 1002 may have been partly in revenge for the murder of his sister. An alternative version is that Pallig deserted the service of King Æthelred in 1001, and that the massacre was partly Æthelred's revenge. Didacus of Alcalá, also known as Diego de San Nicolás, was a Spanish Franciscan lay brother who served as among the first group of missionaries to the newly conquered Canary Islands. He died at Alcalá de Henares on 12 November 1463 and is now honored by the Catholic Church as a saint. Saint Eugenius II, sometimes called Eugenius the Younger as the successor of Eugenius I, was Archbishop of Toledo from 647 until his death. Frances Xavier Cabrini, also called Mother Cabrini, was an Italian-American religious sister, who founded the Missionary Sisters of the Sacred Heart of Jesus, a Catholic religious institute that was a major support to the Italian immigrants to the United States. She was the first naturalized citizen of the United States to be canonized by the Roman Catholic Church, on July 7, 1946. Saint Agostina Pietrantoni - born Livia Pietrantoni - was an Italian professed religious and a nurse from the Thourets. Pietrantoni worked in the Santo Spirito hospital in Rome where she tended to ill victims in a tuberculosis ward before a patient murdered her in 1894. Saint Brice of Tours was a 5th-century Frankish bishop, the fourth Bishop of Tours, succeeding Martin of Tours in 397. Wikimedia Commons has media related to November 13 .